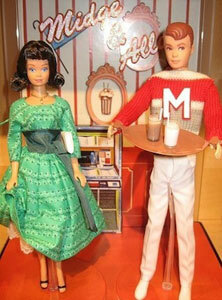 Love, Set, Match: Dolls of real-life couples and famous screen pairings make collectors tingle! 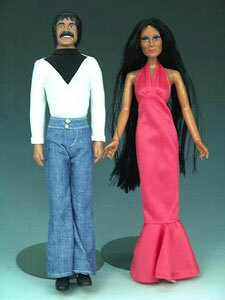 Midge and Alan played second fiddle to Barbie and Ken. Interestingly, the second bananas got to the altar first! Barbie has a lot to cheer about—when it comes to romance, she always has Ken to fall back on. The guy is persistent. Try as they might, PR agents can’t make Kate Upton and Maksim Chmerkovskiy into a couple for the ages. Kate and Max just aren’t . . .
… Kate and William. They just aren’t! 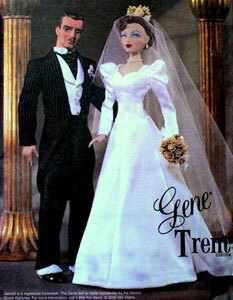 In costumes provided by a Vogue pattern, Gene and Trent were Hollywood swells who sure look swell in their wedding attire. 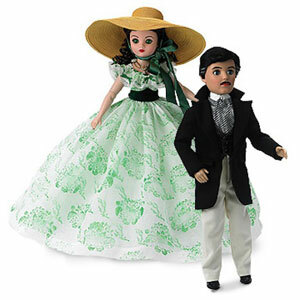 Scarlett O’Hara and Rhett Butler are a Hollywood pairing that have had collectors swooning for more than 70 years. Real-life married couple George Burns and Gracie Allen shared lots of laughter and love. Despite their divorces and marital strife, Sonny and Cher always made beautiful music together. Onscreen, they sizzled. Off-screen, they had a deep friendship. Rock Hudson and Doris Day were the king and queen of romantic comedies. 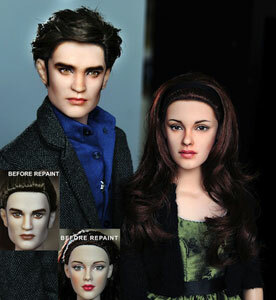 The king and queen of the romantic horror saga are Edward and Bella (shown here, designed by noelingdeviantart). Love can make you feel super every day—here are Mattel’s new Superman and Lois Lane incarnations. 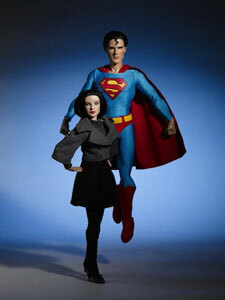 Robert Tonner’s depiction of Superman and Lois take flight. … her handsome onscreen leading man. 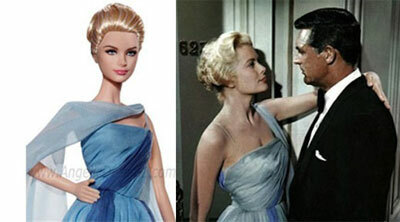 Perhaps a Cary Grant doll to join her? Have you heard the news? If you were anywhere within five feet of E! Entertainment TV this weekend or trying to gather your e-mail from Yahoo, you were treated to the breathily delivered news that model Kate Upton and “bad boy of the ballroom” Maksim Chmerkovskiy are an item. Upton, who has achieved fame as a nubile bikini model for SPORTS ILLUSTRATED, and Chmerko . . . let’s just call him Max—he became famous for glowering and smoldering on ABC’s DANCING WITH THE STARS. Because he would appear surly and rude, and fight with the judges in a second language, Max became known as the resident hothead hottie (not to be confused with nice-guy, towhead hottie, Derek Hough). Teasers about the Upton-Max “relationship” peppered all the trending sites on Yahoo, and local news anchors were forced to report on it during their newscasts’ 22-minute look at the world. I, for one, was thrilled to see so much air time and cyber space given to two physically well-endowed specimens while our government is teetering on the brink of being shut down, malls are being shot up by hostile terrorists, and chemical weapons may or may not be moving across the Middle East. It’s good to see that journalists have their priorities in order. So, with that said, I’ve decided to do my own salute to couples who deserve to have their connections on par with global affairs. Let’s face it, Max and Kate are NO Wills and Kate. That’s right—an underwear model and an almost Chippendale dancer can’t hold a candle to Prince William and Catherine, the Duchess of Cambridge. I’ll totally ignore the legend that says that William had his head turned by Kate when she wore a barely-there outfit in a charity fashion show. Supposedly, he had always seen her as just one of the boys, but then her revealing ensemble revealed her hidden charms. Let’s just put that factoid behind us. William and Kate are a romance for the ages. Max and Kate are just occupying tabloid headlines until Brangelina adopt another child or Jennifer Aniston finally ties the knot. 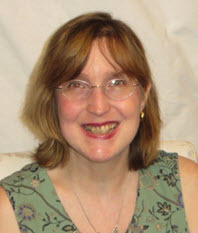 The couples I’m honoring have had staying power. Some of them are real-life romances, like Sonny and Cher. Even after a divorce, they continued to perform and travel together. Despite Cher’s myriad of relationships post Sonny, and his marriage to a future congresswoman, everyone still thinks of the two as linked forevermore in pop culture and in pop music. It doesn’t matter if the dolls are of a true relationship, like George Burns and Gracie Allen, or an ultra fictional one—Rock Hudson and Doris Day!—these pairings all have charisma, charm, and continuity. Doll companies don’t do a lot of couple dolls, because it is hard to make a really manly doll. Often, even the most “butch” attempts come off as too pretty and refined. 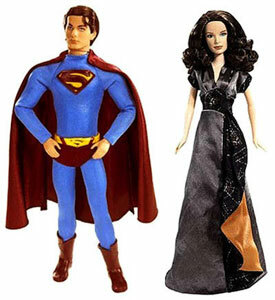 It’s gratifying to see comic-book sweethearts Lois Lane and Superman made as collectibles by both Robert Tonner and Mattel. 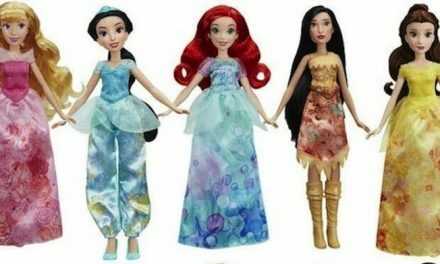 And, of course, if Mattel is mentioned, Barbie can’t be far behind. Like with every successful rom-com (romantic comedy, in film buff speak), the principal couple has to have a second-tier set of foils. 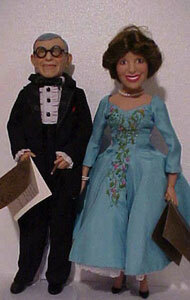 For Barbie and Ken, it’s Midge and Alan. Sure, Midge got to the altar first. And, yes, Midge and Alan were popping out itty-bitty vinyl babies while Barbie and Ken were suiting up as veterinarians and astronauts. Midge and Alan have a sweet, simple, old-fashioned love story: they met at the campus sweet shop, became sweethearts, and have a sweet life together. 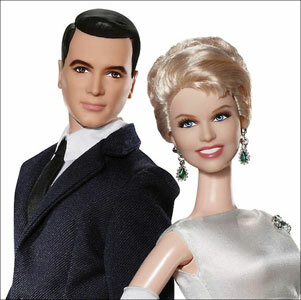 Barbie and Ken are like the Liz Taylor and Richard Burton of the doll realm. They can’t live together; they can’t survive without one another. On again and off again, and on and off, and on and off—they are like a light switch left in the hands of an overactive chimpanzee. 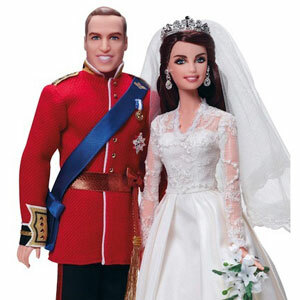 Barbie and Ken have dated, broken up, been engaged, nearly made it to the altar, and have had public ad campaigns begging the public to decide their fate. It’s a big, hot mess, but it’s our big, hot mess, and we can’t get enough of it. Ashton-Drake’s homage to Hollywood and the fantasies that the movie industry spawned was a big success with collectors. I can’t calculate how many dollars I dropped on all the different versions of Gene Marshall and her to-die-for costumes—let’s just say “community college” seems more attainable than “Ivy League” when I sit down to plot out my long-range expenses. Plus, I couldn’t resist acquiring her frenemy Madra Lord, her true-blue pal Violet Waters, and her heartthrob and frequent co-star Trent Osborn. Gene, with her screen goddess allure, and Trent, with his aristocratic, dashing good breeding, were a match made in a casting director’s overactive imagination. With her healthy, shiny tresses and his sophisticated moustache, Gene and Trent were the doll doppelgangers of Scarlett and Rhett. 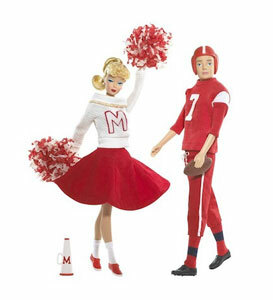 The two matinee idols definitely had that very special connection that all famous couples have: they complemented one another, and they made each other more attractive, desirable, and (in the case of dolls) more collectible! Incidentally, the original Scarlett and Rhett have been turning up as dolls for more than 70 years now—courtesy of Madame Alexander, who got there first, and then Mattel, Tonner, and Franklin Mint, to name a few. So, folks, I don’t think there is a Max and Kate pair of dolls on the horizon. I think they are a pretend “power couple” that has managed to get lots of press, but lack prestige. And, speaking of prestige, Mattel gave us one of the most breathtaking and exquisite leading ladies of all time: Grace Kelly. However, her equally arresting and awesome leading man, Cary Grant, was nowhere to be seen. Perhaps a Cary Grant to match her beautiful “To Catch a Thief” gown is waiting around the corner. That would be a nice Hollywood ending, indeed. 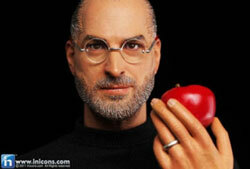 PreviousBody of Proof: These dolls and pop icons have interesting past and double lives. NextFifty Shades of Red: Fall invites artists to experiment with the autumnal auburn highlights. Cuckoo for Kewpies: The adorable love messengers are turning 100 years old. Too Hot to Handle? Computer geeks, Middle East hierarchies & public demand combust.